With all the hoopla and glitter of "Senior Night" at the Hailey high school gym Tuesday, the visiting Jerome Tigers never got rolling and truly didn't know what hit them. Seniors from the Wood River High School volleyball team, playing confidently and with tight teamwork on their special night, steamrolled the Tigers 25-13, 25-15, 25-22 in the Great Basin Conference match. Wood River (15-14, 6-3 league) locked up the second seed in next week's GBC tournament at Twin Falls High School and swept the season series with Jerome (8-10, 5-5). "Our defense and passing were very solid," said Wood River head coach Tim Richards, who started his five seniors—Jade Glenn, Allie Hesteness, Ali Levy, Hunter Thompson and Jessica Hamilton—along with sophomore star Lily Richards. Wood River's tight defense and superb digging from the back row led by Libero Levy (8 digs) gave Jerome's hitters little margin for error, and many of the Tiger attacks sailed long. It wasn't until the third game that Jerome, younger and less experienced than Wood River, finally got its blocking into gear. And the Tigers didn't start finding any holes in the Hailey defense until it was too late in the third game. Richards credited most of the Tiger woes to the play of his seniors and the progress they've made from day one of practice to tourney time. 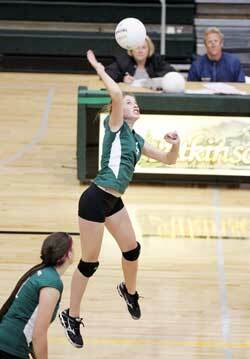 The coach said, "Hunter Thompson has learned to control her body and get up and block at the net. Jade Glenn really stepped it up tonight, hitting the ball down to the floor instead of hitting at people. Ali Levy is the glue of the team with her passing. "Allie Hesteness really came to play tonight and did well for us on the outside. And Jessica Hamilton, well, what can you say, she's just so solid, she hasn't come off the floor all year, and always does what she has to do." Leaders against Jerome included Glenn (8 kills, 4 blocks, 2 digs), Thompson (5 kills) Hesteness (10 kills, 3 digs, 2 aces), Hamilton (14 assists, 4 kills, 2 blocks), Kori Paradis (2 kills), Levy (3 kills) and Lily Richards (3 kills, 7 assists, 5 digs). The Wood River serving was very consistent and never gave Jerome a glimmer of hope. Paradis, Glenn and Hesteness each served seven winners, Richards added five, Hamilton four, Thompson and Levy three apiece. Lengthy stints at the serving line by Richards and Paradis in the first game, and by Hesteness in the second game, got the Wolverines off and running. Senior Carrie Thibault and junior Haylee Burnham did most of the damage when Jerome scored. Regular-season champion Twin Falls (34-5, 9-0 league) hosts the six-team Great Basin Conference volleyball tournament starting Monday, Oct. 18. The resurgent Minico Spartans pushed the host Bruins to five games before Twin Falls won Tuesday night, and Wood River visited Minico Thursday in the regular-season finale. During the three-day league tournament that wraps up Thursday, Oct. 21, the top two GBC teams will earn berths in the eight-team State 4A tournament Oct. 29-30 at Kimberly.